Introduces the Agricultural Produce Market Bill in the U. P. Legislative Assembly as a private bill to safeguard the interests of the producer against the rapacity of food-grain dealers and traders. However, facing stiff opposition by vested interests, the bill is not passed until much later in 1964 when he became Cabinet Minister for Agriculture. It is said that the Government of Punjab passed its Mandi Samiti Act in 1940 based on the draft bill presented by Charan Singh. Leads a pressure group of Congress Legislators to protest with Govind B Pant, the Premier, the absence of progress in effective administration in the United Provinces, specially the behaviour of the Police and Civil Services. On 5 April 1939 proposes a resolution before the executive committee of the Congress Legislature Party, calling for reservation of 50% of positions in public sector jobs for the sons and dependents of the cultivators or agriculturalists. The resolution, however, is received lukewarmly and not accepted by the party. Studies the issue of Zamindari abolition carefully. Formulates the Land Utilization Bill, precursor of the Zamindari Abolition and Land Reform Bill, calling for the transfer of land ownership to all tenants or actual tillers of the soil who chose to pay an amount equivalent to 10 times the annual rental on the land they cultivated. The bill faces stiff resistance from landlords and therefore is not placed in the Assembly. Publishes several articles proposing various measures for the protection and promotion of the interests of the cultivators. Also introduces a resolution before the Congress Legislature Party prohibiting any enquiries with regard to the caste of any Hindu who seeks admission in an educational institution or a position in any government service, except in the case of Scheduled Castes. Plays a leading role in the formulation and passage of The United Provinces Agriculturists and Workmen Debt Redemption Bill, a measure to provide relief to the cultivators that frees several farmers of Uttar Pradesh from the clutches of moneylenders and debt and helped thousands of farmers in saving their fields from public auction. Moves to Meerut city from Ghaziabad in late 1939, post the resignation of the Congress Government in November. 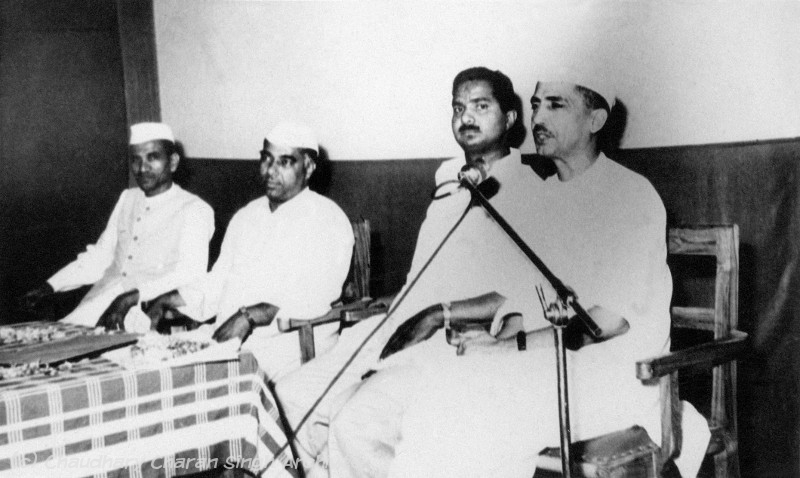 Holds one of two positions, President or General Secretary, of the Meerut District Congress Committee until 1946. Establishes himself as a prominent spokesman for the interest of peasant cultivators, sponsoring several measures before the party and in the legislature on their behalf. United Provinces Assembly in force from 17 July 1937 to 2 November 1939. Fifth child, Ajit, born on 12 February.